1Offer subject to credit approval. Not everyone will qualify for the Carnival World Mastercard credit card and its benefits. If at the time of your application you do not meet the credit criteria previously established for this offer, or the income you report is insufficient based on your obligations, we may not be able to open an account for you or you may receive a Platinum card and benefits will vary. Please review the materials provided with the cardmember agreement you will receive after account opening for more information about the benefits that will apply. This offer is available through this advertisement and may not be accessible elsewhere. For information about rates, fees, the annual fee and other costs associated with the use of the credit card program, please see the Terms and Conditions. Annual Fee: $0. 0% introductory APR on balance transfers made within 45 days of account opening is applicable for the first 15 billing cycles that immediately follow each balance transfer. 0% promotional APR on "Qualifying Carnival Cruise Booking Purchases" is applicable for 6 billing cycles from the transaction date. These introductory and promotional APR offers do not apply to other purchases and cash advances. For new and outstanding balance transfers after the introductory period, and for outstanding "Qualifying Carnival Cruise Booking Purchase" balances after the promotional period and all other purchases, the variable APR is 16.24%, 21.24%, or 26.24% depending upon our review of your application and your credit history at account opening. This introductory APR offer does not apply to purchases and cash advances. For purchases, and new and outstanding balance transfers after the introductory period, the variable APR is 16.24%, 21.24%, or 26.24% depending upon our review of your application and your credit history at account opening. The variable APR for cash advances is 27.49%. The APRs on your account will vary with the market based on the Prime Rate and are subject to change. For more information see the "About the Variable APRs on Your Account" section of the Terms and Conditions. The minimum monthly interest charge will be $0.50. Balance transfer fee: 3% (min. $5). Cash advance and cash equivalent fees: 5% (min. $10). Foreign transaction fee: 0%. See Terms and Conditions for more information about the terms of this offer. The Carnival Rewards Program offers Cardmembers the opportunity to earn rewards towards purchases made with the Carnival World Mastercard including cruises and onboard charges to Sail & Sign®, Carnival's onboard charge program, and purchases made with the brands of the World's Leading Cruise Lines. Cardmembers that redeem FunPoints for a cruise or cruise discount will receive it in the form of a credit on their monthly statement for purchases made within the last 180 days. Cardmembers can book their cruise anywhere, pay with the Carnival World Mastercard, and redeem for discounts at BarclaysUS.com. Restrictions apply. Government taxes, fees, and Fuel Supplement may apply. See Terms and Conditions for more information. Cardmembers will be responsible for all charges incurred in connection with their cruise (including travel to port of departure). Additional charges may include but are not limited to gratuities, onboard purchases, shore excursions, optional programs, and other charges (alcoholic beverages, soft drinks, laundry, and dry cleaning). An example Cruise Redemption is booking and redeeming FunPoints for a 4-day Western Caribbean Carnival cruise on January 11, 2021 leaving from the Miami, Florida port either on Monday January 18, 2021 or Monday January 25, 2021. The Interior Room Rate per person is $229.00 US Dollars which equates to 21,801 FunPoints. Other Cruise-related redemption options are available such as onboard spa experiences and merchandise offers beginning at 5,000 FunPoints. Rates are per person, based on category 4A and above, double occupancy, capacity controlled, and cruise only. Prices subject to change without prior notice. Government fees/taxes are additional per guest. Offer is capacity controlled and applies to new individual bookings only. Offer is not available on all departure dates and ships. Some restrictions (including stateroom/category availability) apply. Ships' Registry: The Bahamas and Panama. Statement credit redemption value toward Carnival purchases will vary based on the amount of the Carnival purchase as follows: Carnival Net Purchases between $50.00 and $1,499.99 will be at a 1% redemption value. Carnival Net Purchases between $1,500 and $5,000 will be at a 1.50% redemption value. 20,000 Bonus FunPoints will be awarded at the close of the first billing statement after you make your first purchase or balance transfer. 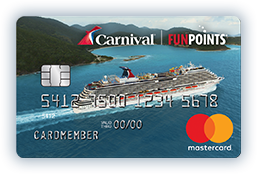 You will earn 1 FunPoint per $1.00 in balances transferred to Carnival Rewards Mastercard after the Account is opened in the first 30 days, up to a maximum 5,000 FunPoints. There is a fee for Balance Transfers. See the Terms and Conditions for complete details about this offer. The CarnivalTM World Mastercard® is issued by Barclays Bank Delaware (Barclays) pursuant to a license from Mastercard International Incorporated. Mastercard and World Mastercard are a registered trademark, and the circles design is a trademark of Mastercard International Incorporated.